Travel day from the US/Canada to Nairobi. With a 7-10 hour time difference between the US/Canada and Nairobi, flight will be overnight. Depart very early for Gatamaiyu Forest in the central highlands, stopping en route at Manguo Ponds and another nearby wetland. Especially notable are the secretive White-backed Duck and Maccoa Duck. 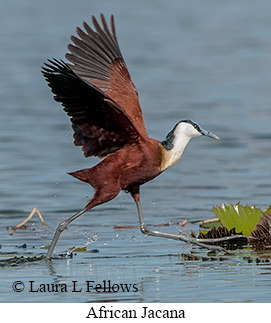 Other wetland birds include Red-billed Duck, Hottentot Teal, White-winged Tern, Whiskered Tern, herons, ibises, spoonbills, and waders. Other likely birds we should see while there include Cape Wagtail, Baglafecht Weaver, Holub's Golden-Weaver, and Grosbeak Weaver. Then continue on to the Gatamaiyu Forest, located in the southern extent of the Aberdare Mountains. 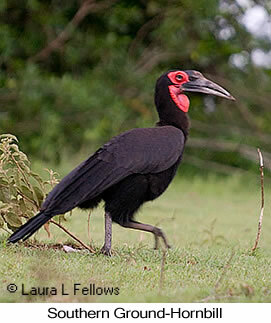 This forest reserve features a good variety of important birds. 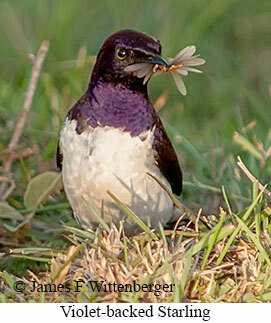 Of special interest is the endemic Abbott's Starling, which can often be seen there. 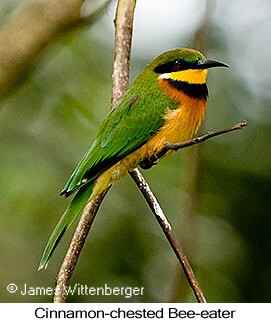 Among the many other birds present are Hartlaub's Turaco, Narina and Bar-tailed Trogons, Cinnamon-chested Bee-eater, three species of Apalis, White-browed Crombec, and Northern Double-collared Sunbird. Also possible are some monkeys such as Syke's Monkey and Guereza Black-and-white Colobus. After birding the forest and having a box lunch, continue to Lake Naivasha, with stops en route to look for open country birds on the Kinangop Plateau above the escarpment overlooking the Rift Valley. 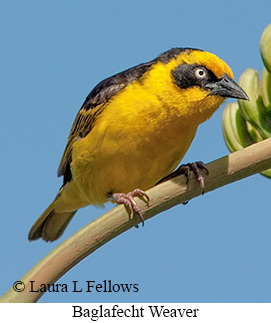 These include the globally threatened Sharpe's Longclaw as well as Red-capped Lark, Capped Wheatear, and Tacazze Sunbird. Night at Elsamere Centre (George and Joy Adamson's former home) near Lake Naivasha. Lake Naivasha is one of two freshwater lakes in the Rift Valley (the other is Lake Baringo). The lake is fringed with Papyrus reedbeds and surrounded by Acacia woodland. Birding the grounds and some trails near the lodge should produce African Hoopoe, Green Woodhoopoe, Sulphur-breasted Bushshrike, Fork-tailed Drongo, Northern Anteater-Chat, Arrow-marked Babbler, Rueppell's Glossy-Starling, Amethyst Sunbird, and Red-headed Weaver. 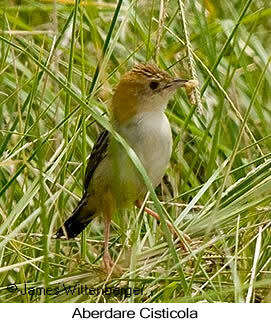 The Papyrus beds are home to Greater Swamp Warbler and Lesser Swamp Warbler. A mid-day boat trip on Lake Naivasha will be a pleasant interlude and good for African Fish-Eagle and many aquatic birds. An afternoon game drive in the national park offers some good mammal viewing as well as birds such as Little Sparrowhawk, Black Goshawk, Giant Kingfisher, and Gray-backed Fiscal. Night at Elsamere Centre. Depart early for Kitale, birding the Kerio Valley en route with stops along the road to check a number of habitats including highland forest, wetlands, and open bush. 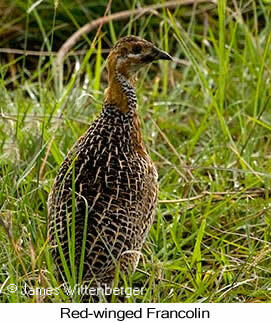 Although much of the valley is agricultural, several new birds are likely. In the highland forest above the escarpment one can expect to see the beautiful Ross's Turaco. A wetland area along the road is a good place for African Rail. After emerging into bushland habitat, look for Crested Francolin, White-crested Turaco, Blue-headed Coucal, Blue-naped Mousebird, Abyssinian Scimitar-bill, Black-headed Batis, White Helmetshrike, Boran Cisticola, Spotted Morning-Thrush, Isabelline Wheatear, Magpie Starling, Mariqua Sunbird, Long-billed Pipit, Golden-breasted Bunting, Southern Citril, Yellow-spotted Petronia, Chestnut-crowned Sparrow-Weaver, and Fan-tailed Widowbird. 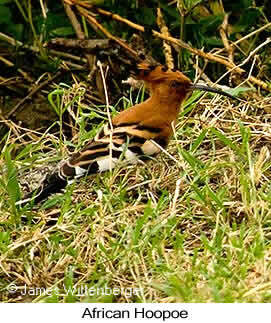 Arrive mid-afternoon, allowing time for some birding around the grounds near the golf course. Some open stands of trees attract a number of more common birds. Night at Kitale Golf Club. Drive down Kongelai Escarpment birding en route. This escarpment separates the western side of the Rift Valley from the lower elevation plateau surrounding Lake Victoria and is home to several birds difficult to see elsewhere. Habitat above the escarpment is dry scrub and grassland where possibilities include Rock Pratincole, Yellow-billed Shrike, Bronze-tailed Glossy-Starling, Heuglin's Masked-Weaver, a very rare bird in Kenya that has a nesting colony near the escarpment, and Black-winged Bishop. During a descent down the canyon, an area of rugged terrain with mountain streams, woodland, and thickets, look for specialties such as White-crested Turaco, Double-toothed Barbet, Mountain Illadopsis, Reichard's Seedeater, and Lesser Blue-eared Glossy-Starling. Also possible are Gray-winged Robin-Chat, a difficult to observe skulker in undergrowth along streams, and raptors such as Dark Chanting-Goshawk, Martial Eagle, and Gray Kestrel. On the plains below the escarpment possibilities include Eastern Plantain-eater, Yellow-billed Shrike, Yellow-bellied Eremomela, Lesser Blue-eared Glossy-Starling, and Black-cheeked Waxbill. Afternoon stop at Saiwa Swamp, Kenya's smallest national park. This park is one of only two places left in Kenya where De Brazza's Monkey is still present. Also present is the Sitatunga, a swamp-dwelling antelope. 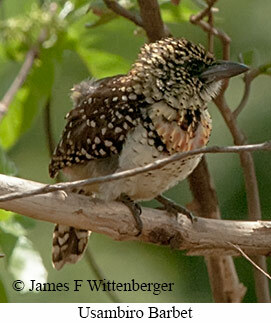 Birds of interest include Blue-spotted Wood-Dove, African Emerald-Cuckoo, Broad-billed Roller, Tullberg's Woodpecker, Black-throated Wattle-eye, Lueder's Bushshrike, Purple-throated Cuckoo-shrike, Little Rush-Warbler, Chubb's Cisticola, Black-collared Apalis, Gray Apalis, Northern Brown-throated Weaver, and Fan-tailed Widowbird. Night at Kitale Golf Club. 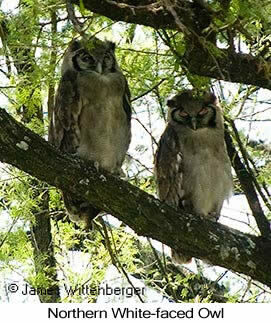 Depart early for Kakamega Forest, the only true rainforest remaining in Kenya, arriving by mid-day. Kakamega Forest Reserve protects a remnant extension of the vast Guinea-Congolian rainforest and is rich in species found nowhere else in Kenya. Most birding is along the main road through the reserve and along various side roads and well-used paths, though there is a good network of trails behind the lodge that is home to many species of the forest interior. Afternoon birding the grounds around the lodge and a trail into the forest from the clearing where the lodge is situated. See below for birds of interest in the reserve. Night at Rondo Retreat Centre. 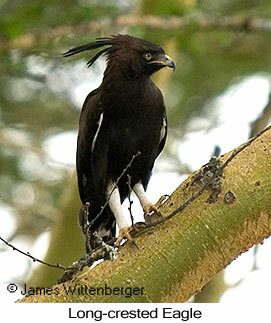 Two full days birding the forest reserve, looking for some 75 target birds for this area. One species, Turner's Eremomela is globally endangered, while another, Chapin's Flycatcher, is listed by the IUCN as globally vulnerable. 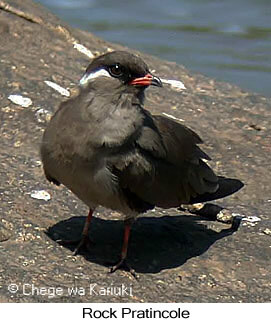 Over 40 other species are found nowhere else in Kenya. 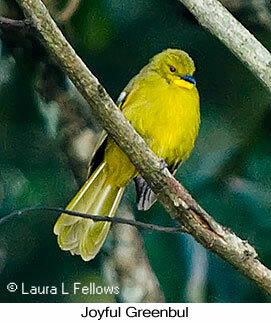 Among the specialties are Delagorgue's Pigeon, Great Blue Turaco, Ross's Turaco, the very uncommon and local Blue-headed Bee-eater, Cinnamon-chested Bee-eater, Yellow-billed Barbet, Gray-throated Barbet, Yellow-spotted Barbet, Buff-spotted Woodpecker, Brown-eared Woodpecker, several species of very locally distributed wattle-eyes, Pink-footed Puffback, Rosy-patched Bushshrike, Gray-green Bushshrike, Petit's Cuckoo-shrike, Square-tailed Drongo, Black-headed Paradise-Flycatcher, Shelley's Greenbul, Joyful Greenbul, Ansorge's Greenbul, Toro Olive-Greenbul, several species of Apalis flycatchers, Black-faced Rufous-Warbler, Green Hylia, the very secretive Snowy-crowned Robin-Chat, Brown-chested Alethe, Equatorial Akalat, Green-throated Sunbird, Red-chested Sunbird, Oriole Finch, Red-headed Malimbe, Viellot's Weaver, Dark-backed Weaver, Gray-headed Negrofinch, Black-crowned Waxbill, and Red-headed Bluebill. Nights at Rondo Retreat Centre. Morning game drive in Masai Mara, concentrating on the drier eastern side of the reserve. Of particular interest will be the Magpie Shrike, a sociable bird of drier Acacia woodlands. Other possibilities include Black-breasted Snake-Eagle, Martial Eagle, Stanley Bustard, White-bellied Bustard, Double-banded Courser, Trilling Cisticola, and Gray-headed Social-Weaver. 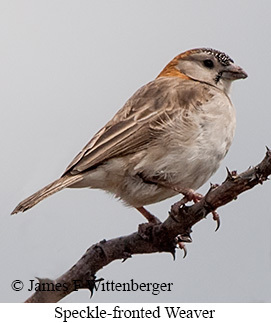 After leaving the park a stop along the road in Masai Land should yield Speckle-fronted Weaver, a bird of arid scrub. Arrive in Nairobi by dark and transfer directly to the airport for overnight flights home. End of tour at the airport.